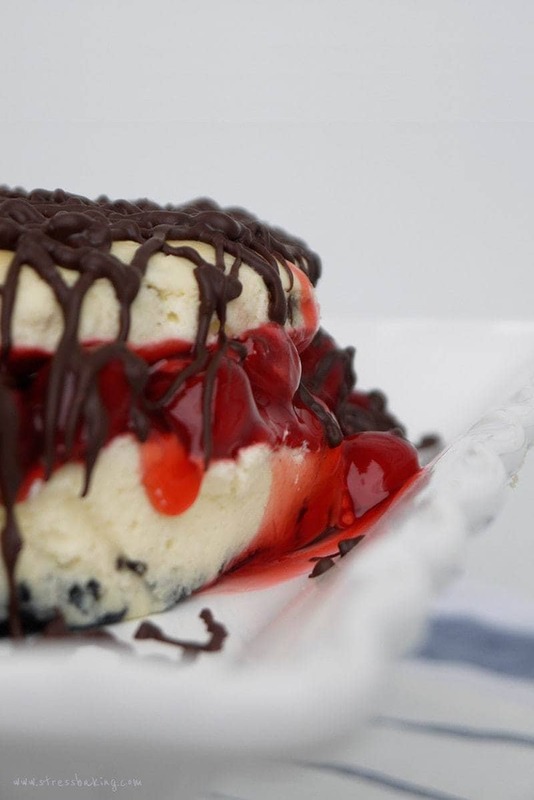 A creamy white chocolate cheesecake full of chocolate chunks, cherry filling and coated with a dark chocolate drizzle. 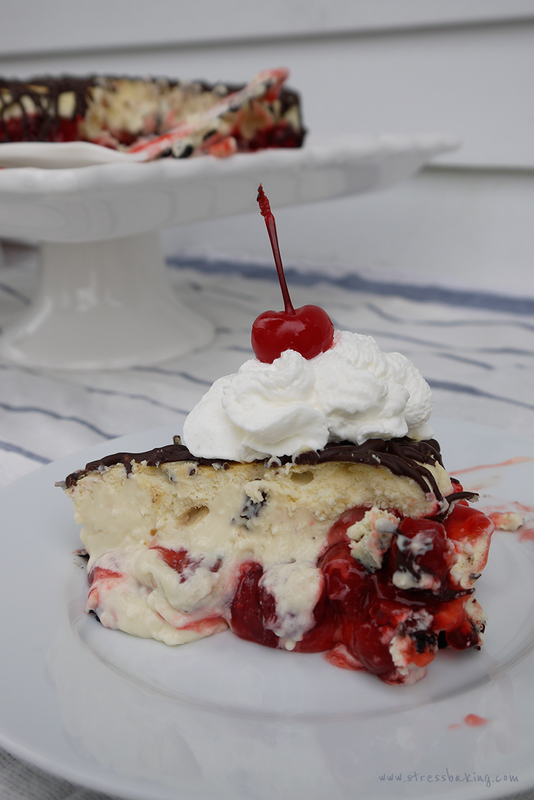 I recently went to a Ruby Tuesday (don’t judge me – I love the salad bar) and I became entranced by the tabletop ad that had a picture of a White Chocolate Cherry Cheesecake. It looked so good. But, cheesecake would pretty much completely negate the purpose of eating salad so I passed. It haunted my thoughts. I couldn’t stop thinking about it while I did my grocery shopping. 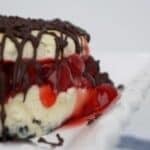 I’d pick up a bag of chocolate chips and get lost in thoughts of creamy, rich white chocolate cheesecake, drizzled with cherry sauce and chocolate. I finally caved and decided I would make my own, so I picked up the ingredients I thought I would need and headed back home with every intention of making it right that second. …and then I decided to fall asleep on the couch, so I didn’t. A couple weeks went by (and I was still thinking about it), so this past weekend I decided it had to be done. I piled all the ingredients on the counter and got to work. Now mind you – I was half winging it because I couldn’t remember what the description for the one at Ruby Tuesday was, and I also knew it was going to be at least slightly different anyway because I wanted to use cherry filling and theirs didn’t have that. I believe theirs is more of a cherry mousse (which sounds amazing, but I had no idea where to start with that). Use the good stuff. I’m not messing around here. Don’t use white chocolate chips, don’t use an off-brand, use the good stuff. You will absolutely regret it if you use a lower quality white chocolate. So what is the good stuff, you ask? I used a Ghirardelli White Chocolate Baking Bar (you’ll want to use two). I meant to take a picture of it in it’s packaging, but I got so engrossed in the process I completely forgot. This is not the first time I’ve mentioned how important using a good white chocolate is, and it won’t be the last. When I was at the store, there was a package of cream cheese that stood out on the shelf – it got my attention and I wasn’t quite sure why, so I leaned forward to pick it up and check it out when I realized it was Cabot brand. I’m fairly sure this is a new addition to their product line (don’t quote me on that) because if I had noticed it before, I absolutely would have bought it sooner. 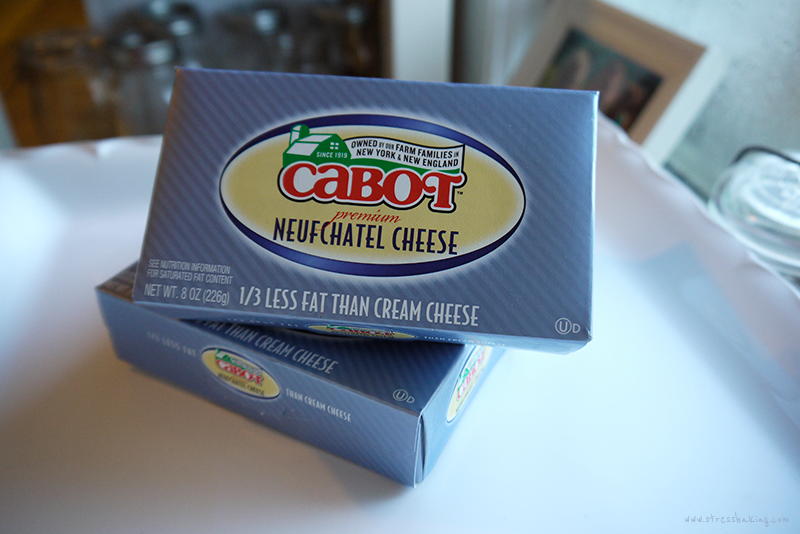 I lived in Vermont for a long time, and one thing I grew to love while I was there was Cabot. Cheese, butter, whipped cream… mmm. Anyway, back to my shopping trip. 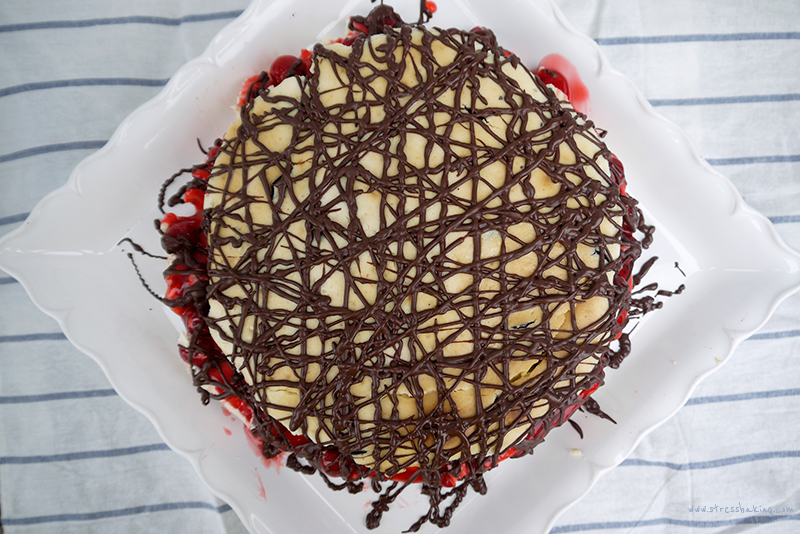 I picked up a few packages and was very excited to give them a shot in this cheesecake recipe. I should note that I used their Neufchatel Cheese, which is 1/3 lower fat than typical cream cheese – great for your diet, not so great for your cheesecake’s consistency. I knew going into it that the filling wouldn’t be as firm and I was okay with that – but for a more traditional cheesecake, go for the real, full-fat thing. 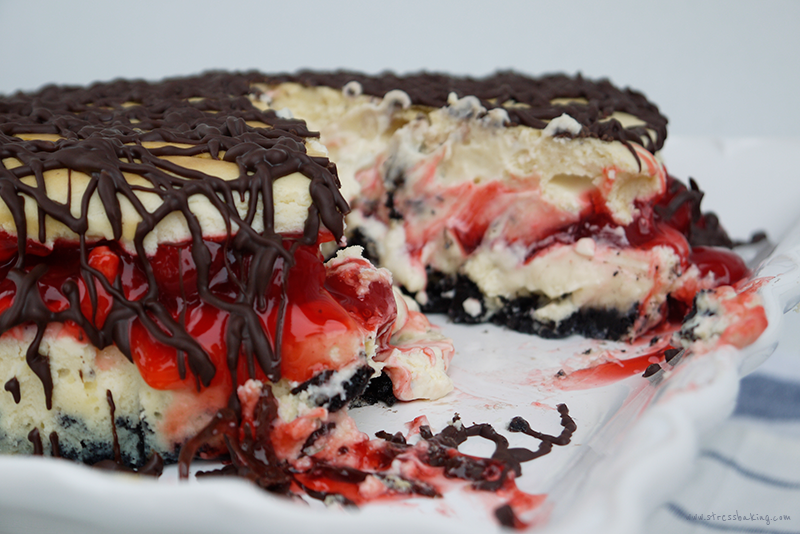 As for the cheesecake itself, it turned out completely delicious and rich – just the way I wanted it to. It was not, however, very pretty. This is due to the lower fat cream cheese I used and like I said – I anticipated it wouldn’t be as firm. Because of the looser consistency and the cherry filling in the middle, it kinda falls apart when I cut into it. For the purpose of eating and enjoying it, I don’t care. For the purpose of photographing it and convincing you that it’s delicious… I care a lil’ bit. Place your cheesecake on a baking sheet filled with water while it cooks – this will give it the moisture it needs and keep your cheesecake from drying out and help prevent cracks on the surface. Wrap the outside of your spring form pan with aluminum foil – at least two layers. Feel free to add more if you’re super paranoid (like me). When you pour the cherry filling into the middle, don’t let it spread to the edges. I didn’t do such a hot job at that part. Crush your Oreos in a food processor rather than the plastic bag and rolling pin method – they both work, but the finer crumb you have, the better your crust is going to stick together. Don’t place parchment paper on the inside of the pan. While some people recommend it and it definitely helps keep the filling intact, it makes the process of removing the cheesecake from the pan and placing it on a serving platter nearly impossible. So you see that picture above? Ignore the paper on the inside and just wrap the outside with foil. Despite how messy it was, I still think it looks mouth-watering. Just look at the way the cherries are spilling out – I just want to grab a spoon to scoop them out the picture and shove them in my face. Now go make this for your next dinner party and listen to people ask for seconds, because let’s be honest – isn’t that every baker’s dream? Preheat oven to 475° F. Place a baking sheet with a large lip inside while it preheats. 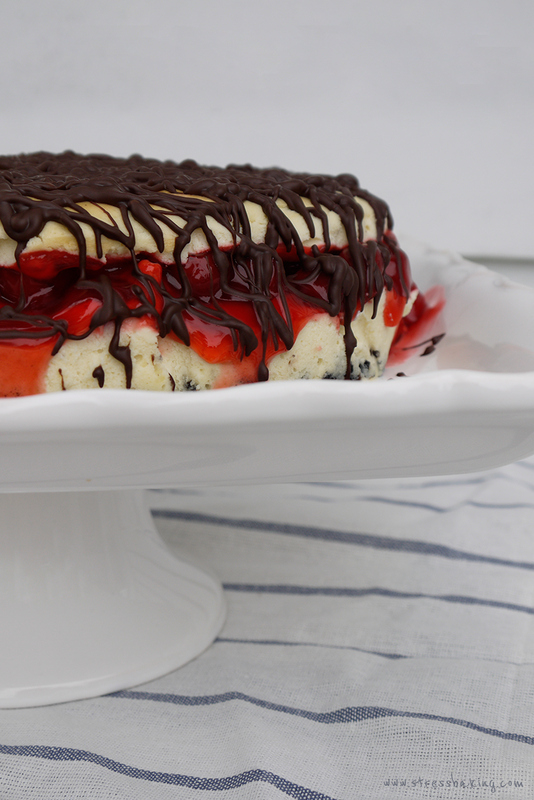 You’ll be adding water to this just before you place the cheesecake inside. Don’t do it now, otherwise it will evaporate! Wrap the outside of the pan with at least two layers of aluminum foil – this will prevent water from seeping in from the water bath. Set aside. Remove the filling from each of the Oreos and then crush them in one of two ways: Place the wafers in a plastic bag and use a rolling pin to crush them as fine as you can get them. Or, place the wafers in a food processor and pulse them into a fine crumb. In a medium microwave safe bowl, melt butter in the microwave. Add crushed Oreos and stir to combine. Press crumb mixture into the bottom of your prepared spring form pan, and slightly up the sides. Place it in the freezer while you prepare the cheesecake filling to let it firm up. In a small bowl, whisk eggs briefly until yolks are broken and mostly combined with whites. Set aside. In a large mixing bowl, combine cream cheese, sugar, sour cream and vanilla on medium speed until combined and creamy. Add eggs and mix until just combined. In a small microwave safe bowl, melt white chocolate in 30 second increments, stirring each time until completely melted.8) Add melted white chocolate to the cream cheese mixture and combine on low speed until just combined. Add 1 cup of the dark chocolate chunks and stir to combine. 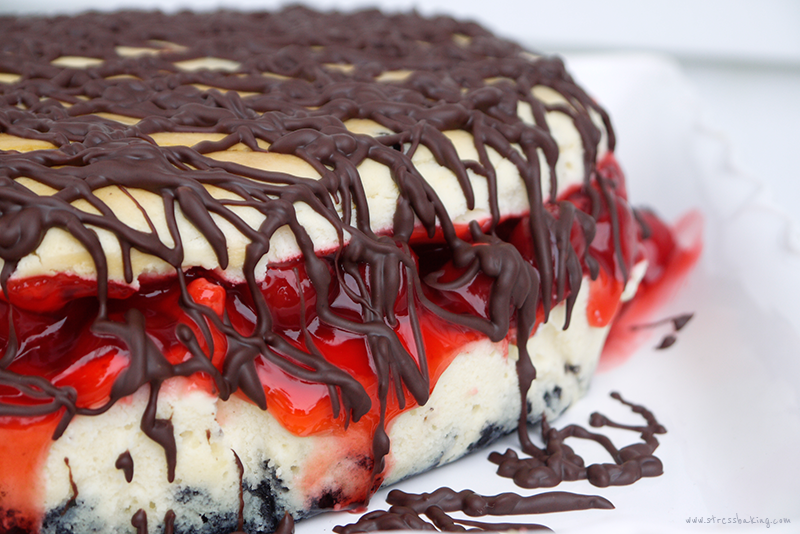 Remove crust from freezer and pour in half of the cheesecake filling. Pour the can of cherry filling into the center, trying your best not to let it reach the edges. Pour the rest of the cheesecake filling on top. Carefully add water to the pan in the oven. Now, just as carefully, place the cheesecake onto the pan. Bake for 10 minutes at 475° F, then turn the oven down to 350° F and bake for another 45-55 minutes. It’s done when the top of the cheesecake turns a light brown color. Remove from the oven to cool. 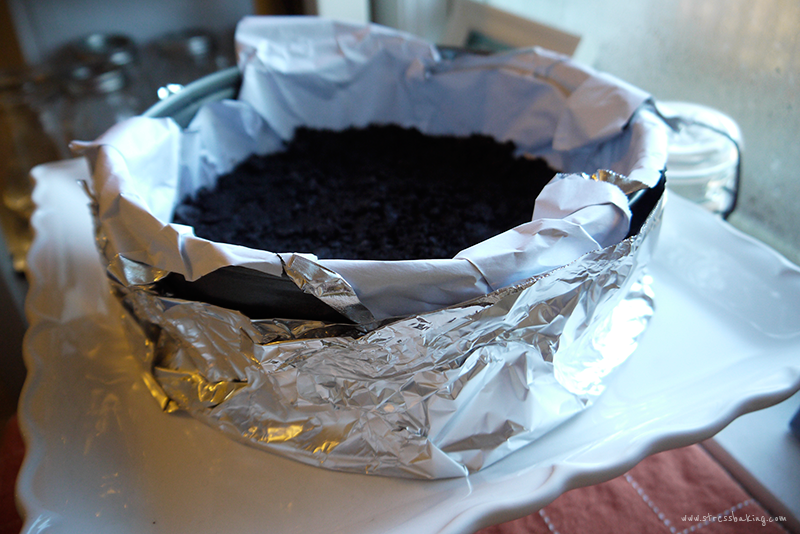 Once completely cooled, cover with foil (you could use the foil that was wrapped around the pan – look at you, recycling) and place in the fridge overnight. It needs to be in a minimum of 5 hours, but I prefer overnight just to be safe. Melt the remaining 1/2 cup dark chocolate chunks and drizzle over the top of the cheesecake in whatever manner your little heart desires. 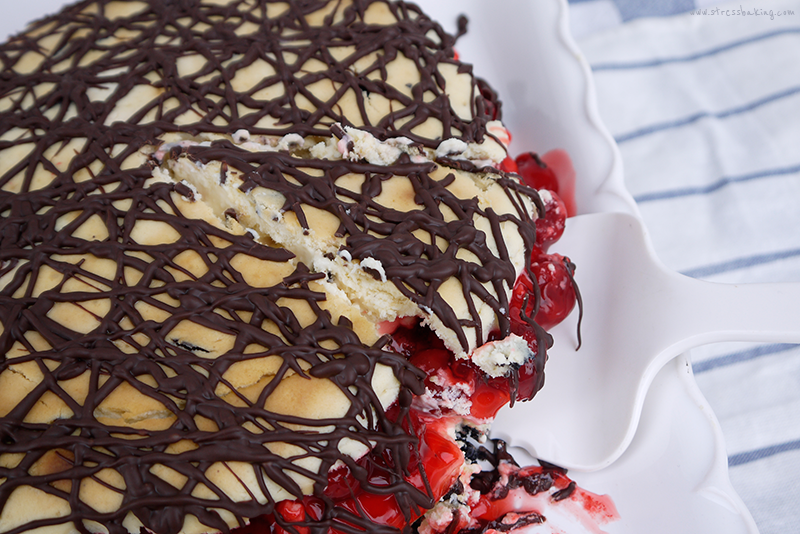 Slice and serve with whipped cream and a cherry on top. Enjoy!